A long time ago I post a simple PS module to access AX2009. Now I've also made a version for AX2012. - Contain Basic Functions to work with AX 2012 through business connector. In my last post I mentioned the reason I use Powershell to draw data from AX. What I want to achieve is ease of drawing data from AX and the ability to save and re-run queries. I wrote a basic script module to do this. The main utility from the module is a new cmdlet New-AXSelectStmt. It is used to pass X++ select statement to AX and get a list of PSObject as return. New-AXSelectStmt CustTable -stmt "SELECT * FROM %1"
In terms of actual usage, I have a case where a user's ask about the net weight shown on an invoice. In the invoice printout, a line of 10pcs is shown to weight 0.197g. However, on the item details form the net weight per piece is 0.02. The user thinks there is an error. I used the query below to quickly check the actual net weight stored in the database and show user what happened. New-AXSelectStmt CustTable -stmt "SELECT * FROM %1" -top 10 | Export-CSV "C:\Temp\custList.csv"
Not long ago I started a new position as an in-house AX specialist. Part of my job is to provide support to users on their AX issues. Here I face a challenge that, due to organization structure, I don't have direct access to the SQL database. If I want to quickly check some data in AX I am then left with the table browser. Another option is to write X++ jobs but then I'll have to take care of showing the data (e.g. using infolog) myself. In short, it's not ideal. Here I connect to AX using the business connector. First I have to get the Microsoft.Dynamics.BusinessConnectorNet.dll and put it somewhere. Load it up and create an Axapta object from it. Then I connect to AX and retrieve data. The scripts above returns below when run against the demo database. What's written above works but it just run a very specific query. I'll share a basic script module I put together in my next post. It'll have better reusability. Just to share a quick tip. If you need to know which SSRS reports in AX gather data from AX OLAP cubes, you can run the query below in SSMS against the report server database. There are report name, design name and an XML presentation of the Parameters. The ReportName column contains the name of the reports, which match the nodes under \SSRS Reports\Reports in AOT. This is the final post on my experience with OpenXML SDK. The previous posts are here: Part 1, Part 2, Part 3. In this post I'll introduce the Open XML SDK Productivity tool and a couple of extended libraries for OpenXML. Despite the benefits of OpenXML, there is also a learning curve as it is quite different from working with Excel object model. Luckily, there is help from Microsoft and other developers. This is a tool provided by Microsoft to help developers create OpenXML solution. One of it's most useful feature is you can load up a document and get generated C# source code for creating that document. Here's a link to an 8 mins video showcasing what the Tool does. This tool can be downloaded for free from Microsoft. For example, here is the download link for the SDK and the tool for OpenXML SDK 2.5. Custom libraries are available based on OpenXML SDK. These libraries aims at hiding away lower level details of using OpenXML SDK to simplify the creation of OpenXML documents, without sacrificing performance. I haven't used them as I stick with OpenXML SDK for personal reason. But many developers are finding them very helpful. ClosedXML - An often updated wrapper for OpenXML, with detailed documentation. Simple OOXML - adds the DocumentFormat.OpenXml.Extensions namespace to version 2.0 of the Open Office SDK. So this concluded my series of OpenXML post. For anyone who haven't used OpenXML SDK before I hope these posts encouraged you to give it a try! 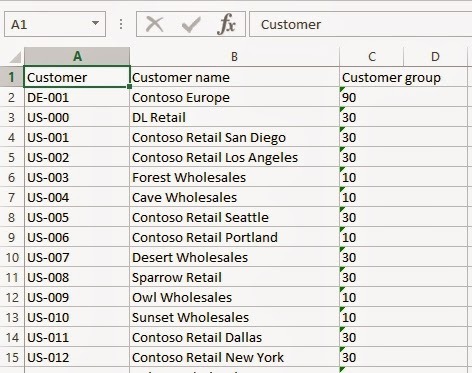 In Part 2, a sample project exporting data from AX to Excel is presented. In this post I'll talk about a few tips I learned. Chances is, the code you write will work on either OpenXML 2.0 or OpenXML 2.5. It'd be nice that the code will run as long as one of them is available on the machine. Add the following code to load the available library during runtime. In the constructor of the export class, subscribe to the AssemblyResolve event. // Try to load ver 2.0 if 2.5 is not found. 2) Debug using Visual studio. Use a conditional statement to create a Session object if necessary. This allow you to run the code in Visual studio without having to create a job in AX to start debugging. It's much more convenient. Testing from AX can start after the managed code part is tested and ready. It is possible to use AX labels by pulling the SysLabel class to the project and write a simple helper method to use it. I tend to use Linq to AX in conjunction with OpenXML. Check out this post by Joris de Gruyter for his comments on, and especially some limitations of, Linq to AX. When developing managed code solution the AOS assemblies hot swap flag is usually turned on. Remember to disable this flag if you are to compile the application with AXBuild to avoid issues. In the next post, I'll talk about tools which helps developing OpenXML solutions. First of all, a Session object is needed. It will be available if the method is called from AX. However, it is much easier/faster to test/debug using Visual studio alone. Therefore, add the following code to create a Session if necessary. The next thing is the SharedStringTable. They help reduce redundancy when the same Text value appears more than once in the workbook. A good post here by Tim Murphy explains it well. // Get the SharedStringTablePart. If it does not exist, create a new one. Then comes the interesting part. I used Linq to AX to get a list of Customers order by AccountNum. Then this list is parsed one by one and their values put into the worksheet. There are the three helper methods here. The InsertSharedStringItem takes a string value and return an index that represent the passed in string. The index returned will be assigned to the CellValue property of the Cell object. The GetCellInWorksheet method takes in colPos and rowPos, among other parameters, and returned the proper Cell object. It will create a new Cell object if it doesn't already exists. Then, the index value is assigned to CellValue property and DateType property is set to SharedString. The MergeAdjCells method merge cells in the worksheet. Download the source code to see the implementation. The full example can be downloaded here. You probably need to fix some project references before it'd work. The solution is created in VS2010 against an AX2012 R3 environment. Set AxOpenXML_Part2 as the startup project and hit F5 to see the result. This post have not covered all the details but hopefully enough to get you started. In the next post, I'll talk about some tips I've learned working with OpenXML and AX.